For years, your organization has perfected project management, and you got pretty good at it. Then one day, you decided to execute a project using a distributed team. Eleven time zones, three languages, five countries. It was a bit disappointing, or maybe a disaster, or at best, well below your organizational standards of performance. This training pack is ideal for organizations that have their own internal training resources, and that want to get better at managing global or distributed teams. How To Orderand distributed teams are now officially the way of things. Everything about such projects or operations is more difficult than face-to-face teams — including figuring out how to declare victory when failure is what actually happened. There really is nothing like live, in-person training by an expert. With the right training, team performance can escalate dramatically. I can do that for your organization, as I have for many others. And it really is the best way to go. But in the current economic situation, a natural question arises: What can we do if we don't have that kind of budget right now? If your organization could benefit from some training in the formation, management and operation of global or distributed teams, but you don't have the budget required for in-person training in this quarter, you don't have to wait. You can do something right now, very economically, that will bridge the gap until you can bring in a live expert (hopefully me!). Relying on your own internal resources, and my materials, you can give your people the insights they need right now to keep your global or distributed teams operating at performance levels that will make everyone proud. This Training Pack includes a complete slide presentation (more than 80 slides) and an accompanying script. It's ideal for organizations that want to deploy an internal training session rapidly and economically, using internal resources. The script is over 20,000 words, which is almost twice the size of Who Moved My Cheese? . What's a global team? You'll find various definitions if you surf around a bit, but the main features of a global team are what make them so difficult to manage — the people are dispersed geographically, they meet infrequently or never, and they come from different cultures. And these three factors conspire to make what's usually easy, difficult — and what's usually difficult, impossible. 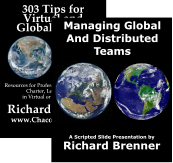 A copy of 303 Tips for Virtual and Global Teams , packed with tips for making your organization more sophisticated and effective in fielding global and distributed teams. By itself, it's more than 27,000 words. A Microsoft PowerPoint® slide set that you can use to conduct training sessions in-house. More than 80 slides. It's designed to be delivered in one full day. You can of course add your own exercises and breakout sessions. A script for the slide set to guide you as you develop what your facilitator will say during the presentation. More than 20,000 words. This item requires Microsoft PowerPoint 2011 or later, and Adobe Reader 6.0 or later. The price is per copy. Order Managing Global and Distributed Teams: Training Pack by credit card, for each, using our secure server, and receive download instructions by return email. You can also order 303 Tips for Virtual and Global Teams in quantity to distribute to participants. It's available electronically, either for per copy, for a 10-copy license, for a 50-copy license, for a 100-copy license, or for a 500-copy license. Check it out.